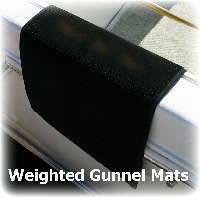 These mats measure 36" x 20" and have weights on the ends to help keep the mat in place when draped over the gunnel. This is a blank gunnel mat with no embroidery. © 2010 - 2014 all rights reserved.